The LA Times article – http://www.latimes.com/business/la-fi-urban-green-20100903,0,588562.story – addressing the intersection of affordable housing and sustainable action raises a number of significant challenges as well as highlighting several relatively successful solutions. Unfortunately, two conclusions, stated or implied, interfere with the simplest, most effective short-term strategies for greening our society. A primary misconception is the belief that to introduce sustainable measures in low-income communities is problematic because of first cost, and second, that the most effective environmental measures take the form of add-ons such as solar panels. In fact, many environmentally responsible approaches have equal or lower first costs than their less sustainable counterparts, as well as reducing ongoing operating costs. Frequently, the only component that must be added is either clearly presented information, or in the case of new buildings or building retrofit, smart design. This should not be seen as lowering of expectations or of quality of life, but rather as maximizing the usefulness of all resources utilized. Mt. 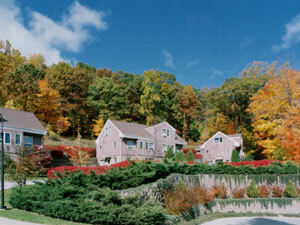 Airy Woods housing is an example of this strategy. Completed in 1995, the twelve unit (six one-bedroom, three two-bedroom and three three-bedroom) complex had an average construction cost of just over $50,000 per unit which was very competitive with similar projects of the era. However, unlike many low-cost housing projects, Mt. Airy Woods incorporated high-performance windows, significantly higher levels of insulation than required by code, responsive heating controls and zoning, earth-buffering, and low-maintenance materials throughout. The use of higher quality materials and systems without compromising the budget was made possible by providing the maximum useful living space in the smallest possible package. While the particulars of the Mt. Airy Woods project will not apply to every, or even most projects, understanding their impact is instructive. The site is steeply sloping, having an average pitch of 1:3. In general, this would have been considered a serious drawback to development; however, it allowed the design of multi-unit buildings with on-grade, direct access to every unit. This, in turn, meant that there was no construction for public corridors or stairs. This not only reduced the amount of building which in itself is a significant environmental benefit, but it also reduced the amount of building area that needs to be heated and maintained. Further, it improved accessibility and security as well as giving each unit the sense of “entry” and arrival. This is a limited explanation of a very specific example but is intended to suggest that the careful application of resources, both those that are purchased and those that pre-exist within the boundaries of a project, can address concerns for sustainability while enhancing quality of life issues, and do so within completely conventional budgets.